Soak cracked wheat in water for 30 min. Place in a bowl, add meat and onion. Season with salt, pepper and spices. Pulse in a food processor in batches until smooth like dough, adding a little ice water if needed. Insert the paddle into the bowl. Spread chopped onion evenly on the bottom of the bowl; add oil, level 5 on the measure. Close the lid, set the thermostat dial to position 4, press the bottom heating element and press the on/off button at the same time. Saut� for 5 min. Add the meat and cook for another 10 min (use a wooden spoon to break up any large clumps of meat that might form). Add the toasted pine nut and cook for another 5 min, cool a little bit to handle. Wet your hands with cold water, take small egg-sized amount of bulgur mixture, form into a ball. Poke a hole with your finger into the centre to form a cup for the filling. Stuff each ball with a small amount of the filling (about one teaspoon). Pinch the top to seal the ball, shape like an egg with pointed ends. Repeat with remaining ingredients until done, wetting your hands with the iced water. Arrange kibbeh inside the bowl, drizzle with oil, close the lid, set the thermostat dial to position 4, press the bottom heating element button and press the on/off button. 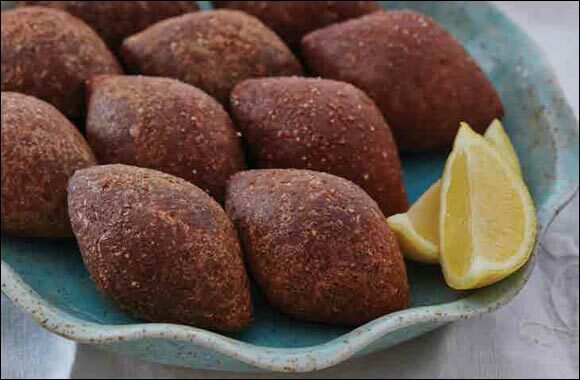 Cook for 8 min, then turn the kibbeh over and cook for another 7 min. Remove and place on a paper towel. Serve warm.